As we move into the fall and winter months, marine debris also moves onto our beloved beaches and coastline. In response to a couple remote debris accumulation areas identified by Oregon Parks and Recreation beach rangers, the Oregon Marine Debris Team is springing into action this weekend to remove this debris – and we need YOUR help! Description: This is a high debris area that requires a lot of walking and aggragating debris for vehicle transport for OPRD. Contact: Fawn@oregonshores.org for more information and questions. Description: Only a handful of volunteers needed. Hosted by the Newport Chapter of the Surfrider Foundation and the Oregon Coast Community College Student Government. Bring: Supplies provided. Bring a bucket and gloves if you have them. Bring: Gloves, dress for weather. Bags, snacks and water provided. Contact: Oregon@surfrider.org for more information. We know that we are already seeing some debris now, but how much will we continue to get and when will it get here? 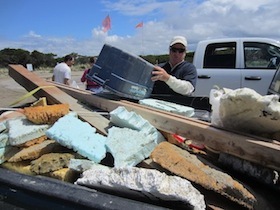 Check out this model and continuing updates from NOAA on Japanese tsunami debris.